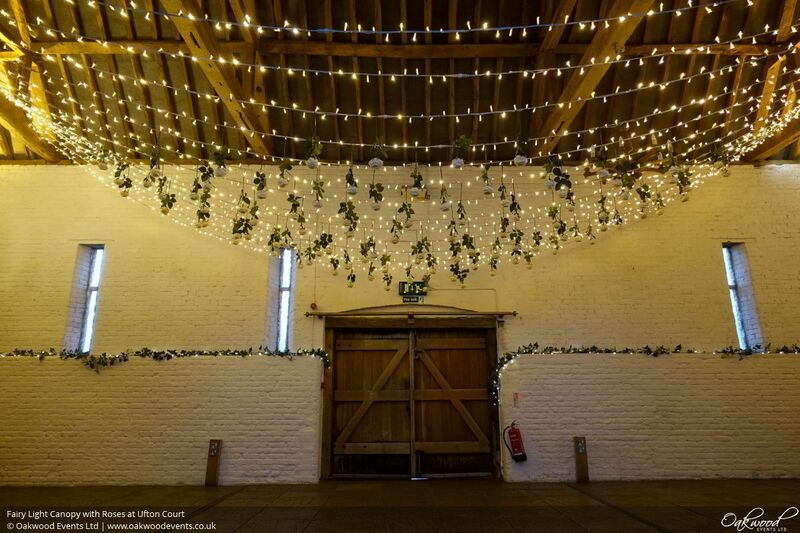 Oakwood Events Blog - Posts Tagged "Fairy Lights"
Our star-shaped canopy of fairy lights sits neatly above the ceremony area in Wenman's Barn at Caswell House. The lights radiate out from a high point in the middle to lower points around the walls, making a pretty display not only for the wedding ceremony but for the whole day! Here's something new: a sparkly fairy light canopy adorned with gorgeous hanging silk roses! 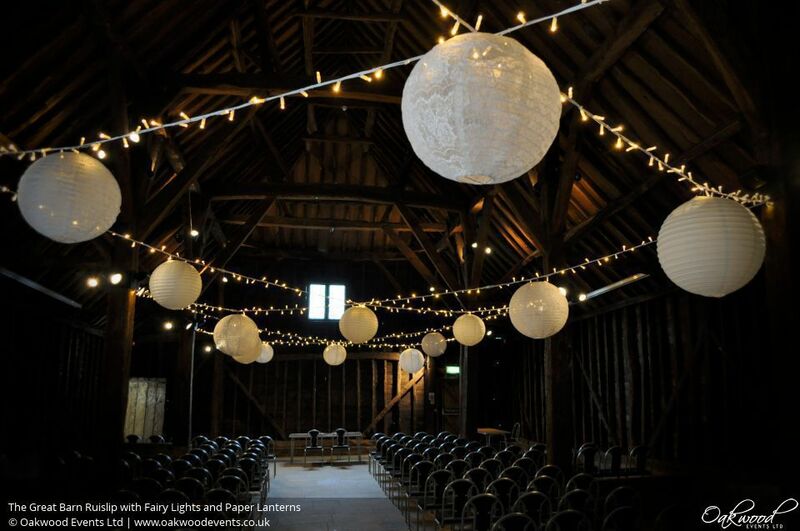 Shown here in Ufton Court's large Tithe Barn, the fairy lights look fab on their own and the design really comes to life with the addition of the roses suspended from the lights. 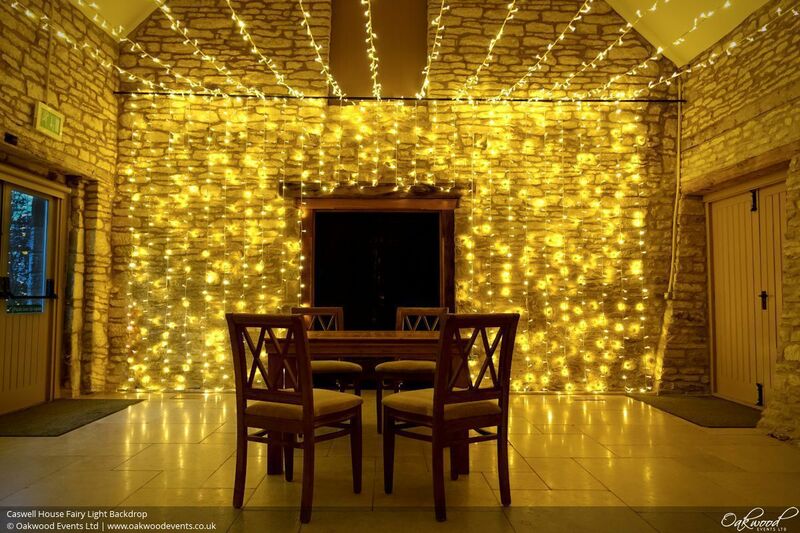 At the risk of stating the obvious, we love fairy lights! What better way to highlight your wedding ceremony than by filling the entire back wall with lots of pretty, sparkly lights? 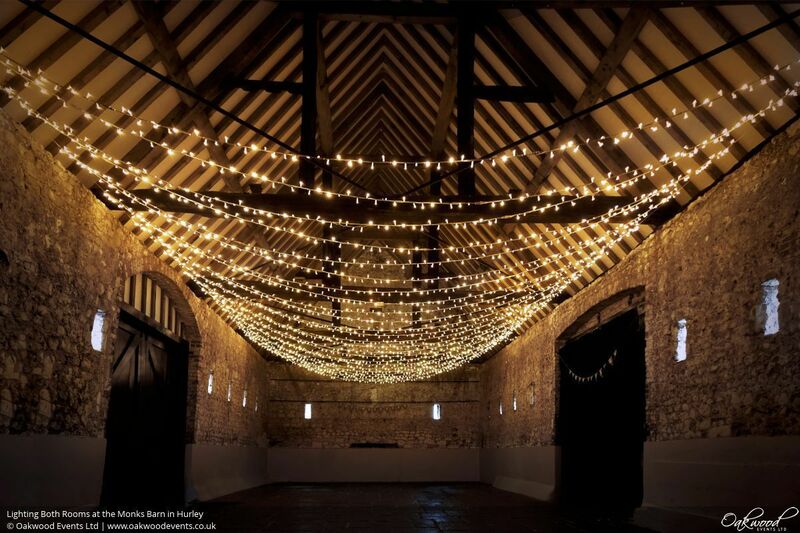 This fairy light star canopy with lit lanterns is one of our most popular designs for lighting weddings in Ufton Court's tithe barn. Here are a couple of photos from the setup prior to a recent wedding showing how the lights transform the barn from day to night. 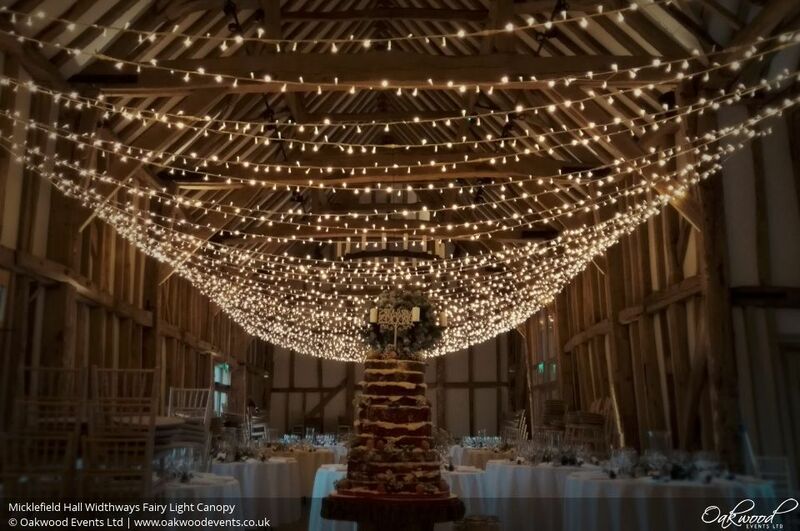 The fan canopy is a dramatic display of fairy lights that suits the layout of the large Tithe Barn at Ufton Court really well. 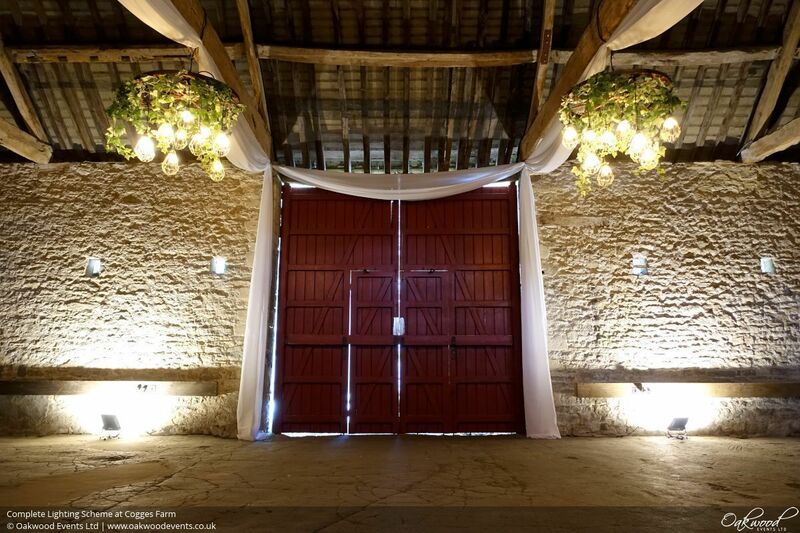 The lights fan out elegantly from a high point above the rear barn doors, where the top table is normally positioned, to a lower point on the opposite side of the barn with the vertical wooden pillars. 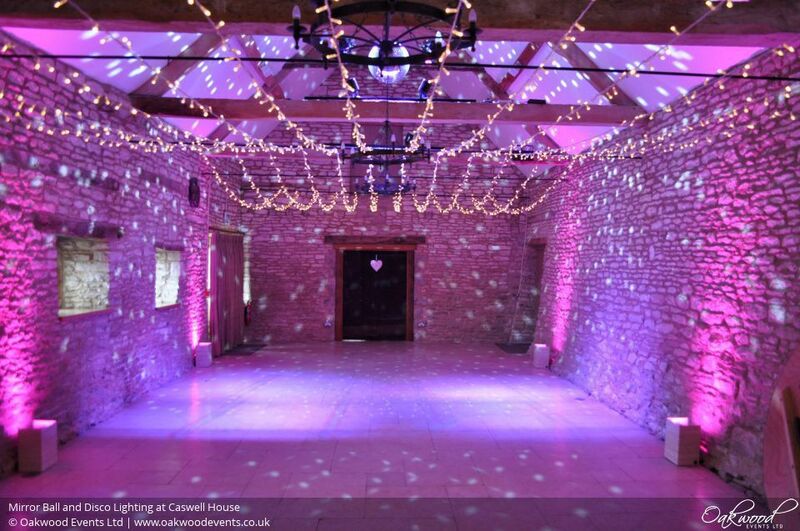 At Caswell House, the area at the end of the large Wenman's Barn is often used for a band or disco in the evening. Why not add some serious sparkle for the evening with a mirror ball and disco lights? 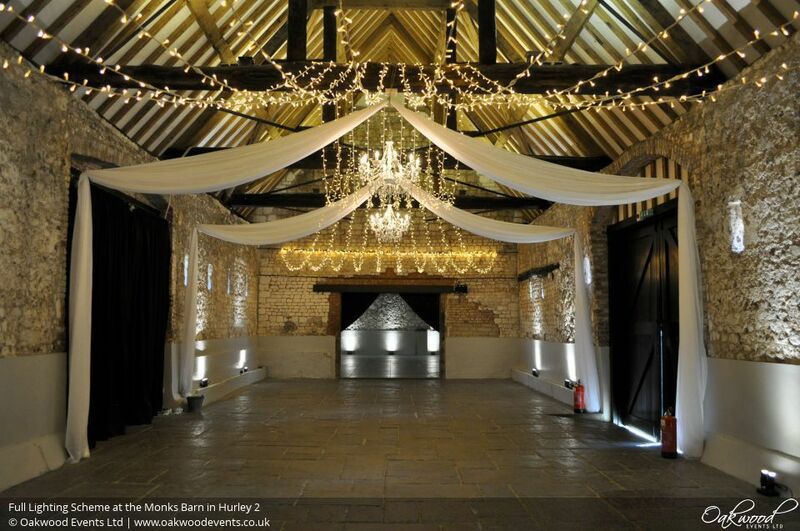 The Monks Barn in Hurley is such brilliant blank canvas for lighting and decoration that there are lots of different combinations available to suit any taste. This full lighting scheme included drapes, fairy lights, chandeliers and LED uplighters for a really gorgeous result. 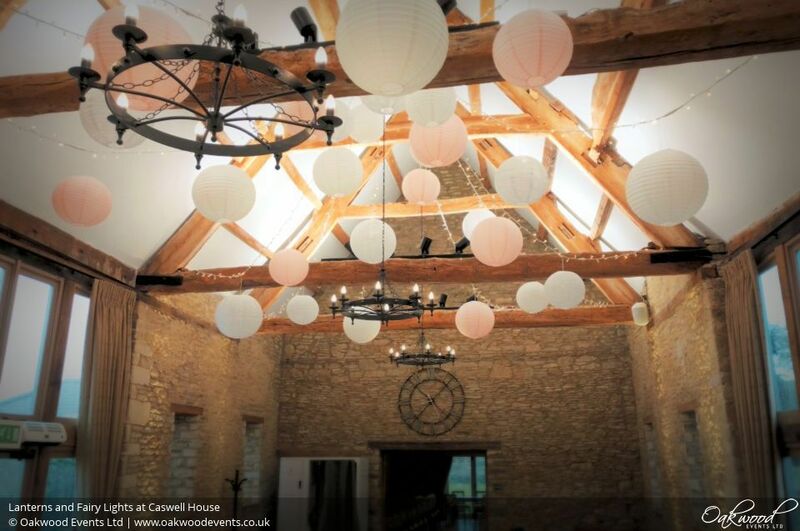 The colour scheme for this stylish wedding at Cogges Manor Farm in Witney was peach, robin egg and dove grey. 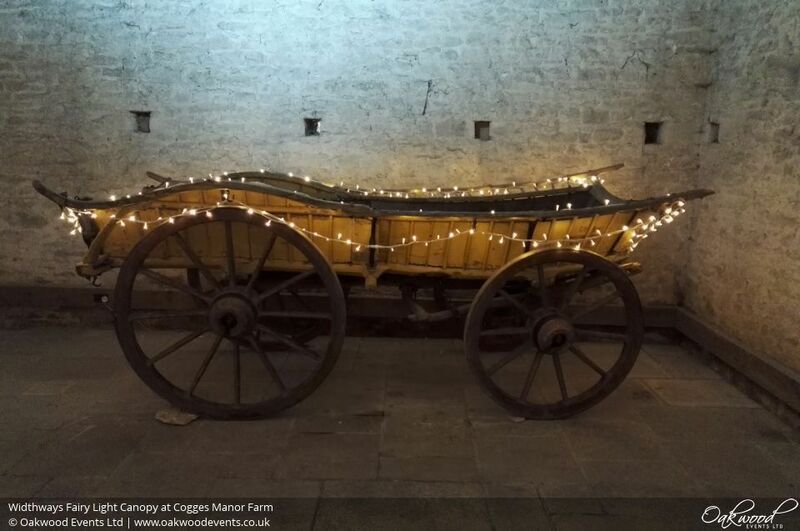 We were asked to supply a lighting scheme to work with these colours while creating a warm and cosy atmosphere in the barn. 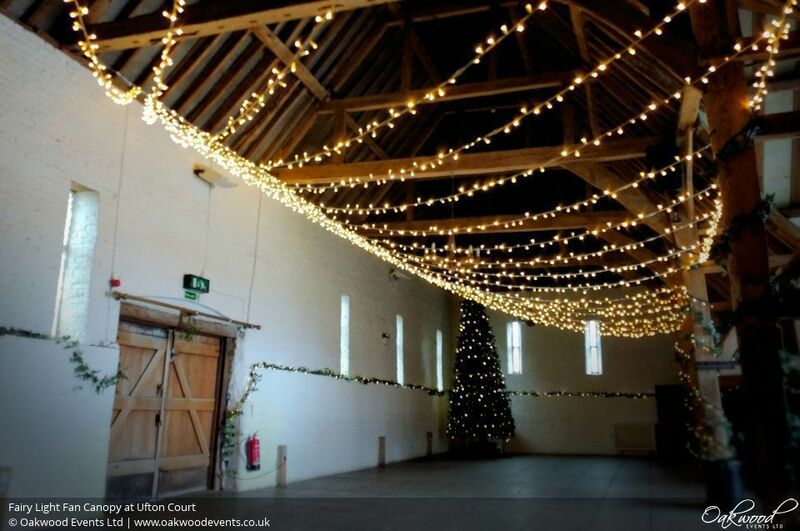 Here's our beautiful, huge multi-swag fairy light canopy in the tithe barn at Ufton Court! 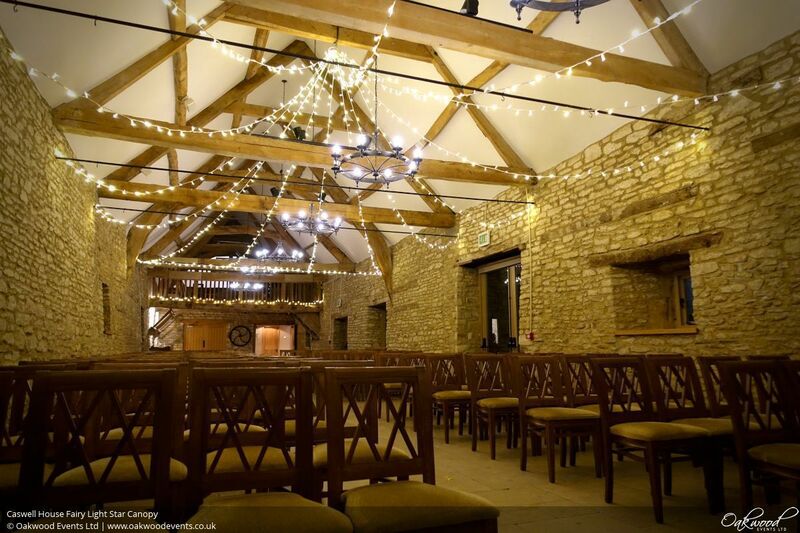 This lovely barn at Newton Park Farm is surrounded by gorgeous countryside - an amazing spot for a wedding reception! 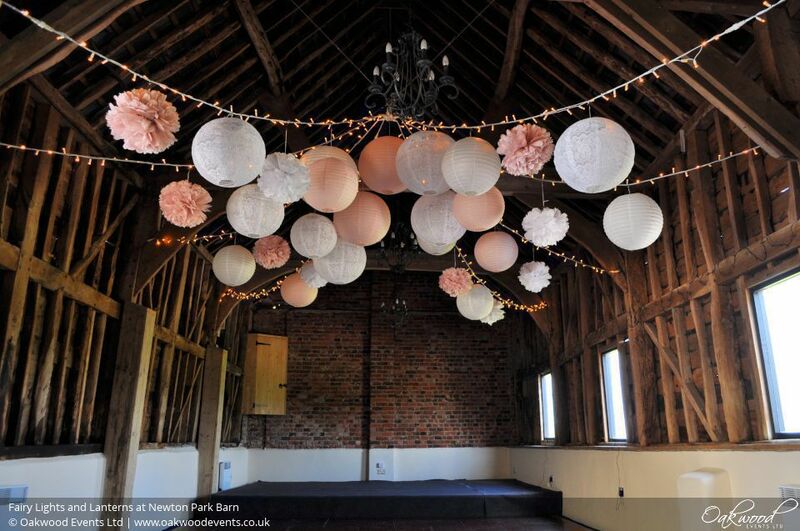 We added a fairy light star canopy inside the barn with a mixture of lanterns and pom poms. 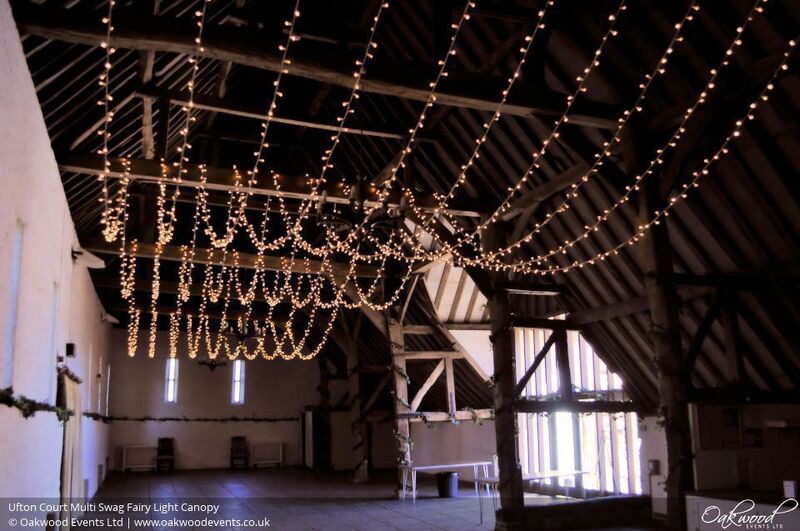 Back to the gorgeous 16th century Great Barn at Micklefield Hall, this time to install a large, super sparkly widthways fairy light canopy! 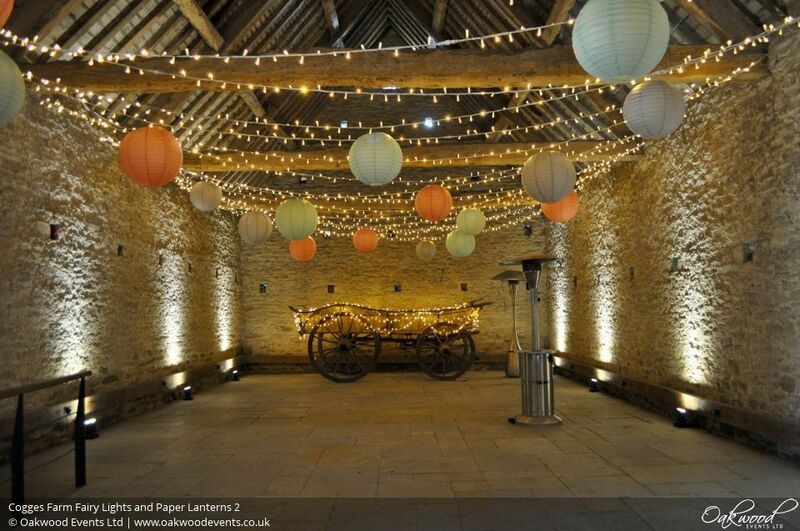 Here's a new fairy light canopy design for the Wheat Barn at Cogges Manor Farm in Witney. This large barn has seven main beams along its length, which means it's great for the gathered canopy with its central "pinch" on the middle beam. Bartlett's barn at Caswell House serves as the reception area as the wedding guests arrive and the bar area in the evening. 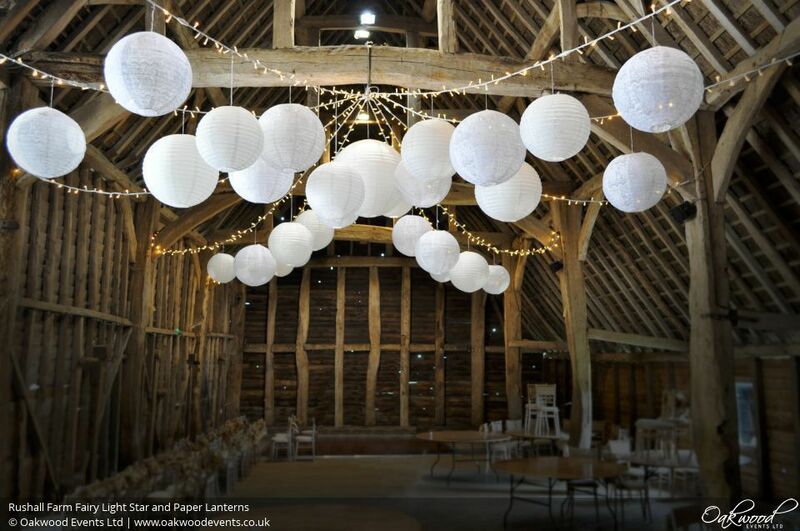 Here's a fantastic way of adding a touch of your own style to the barn by adding hanging lanterns to the fairy lights in the ceiling. 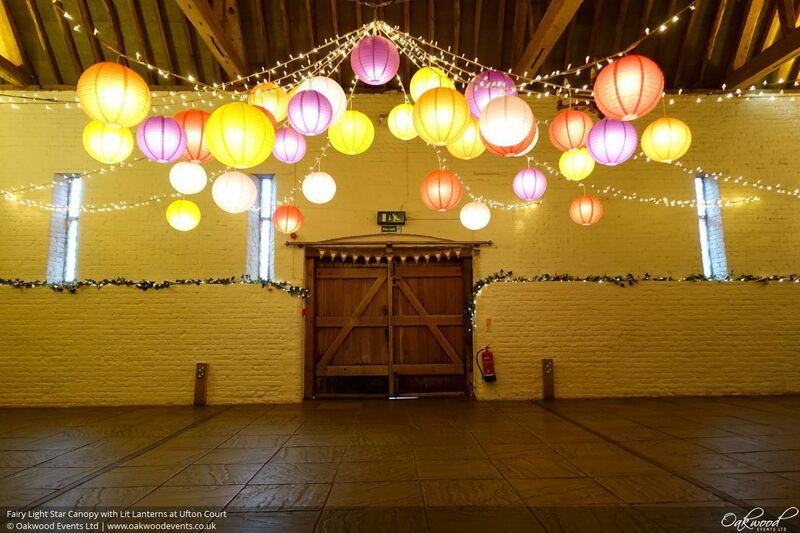 These paper lanterns hung on fairy lights provided a simple but effective display for a wedding in the Great Barn at Manor Farm in Ruislip. 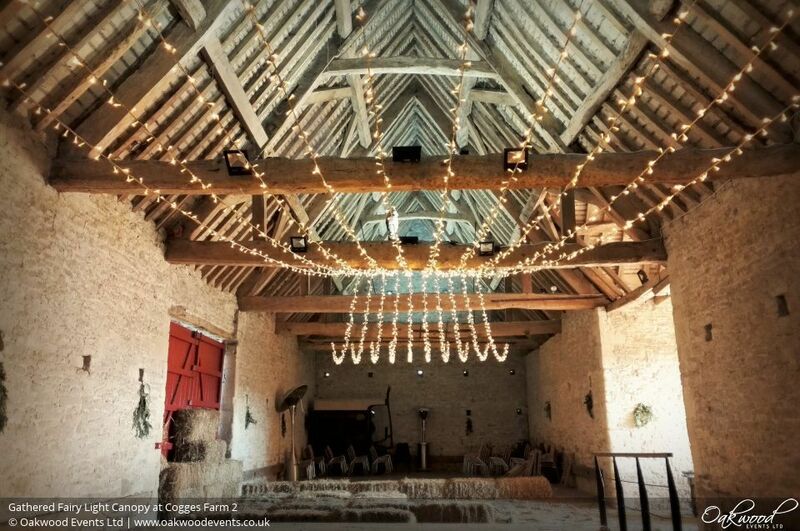 The Wheat Barn at Cogges Manor Farm is big and beautiful - a fab space for a wedding or party. 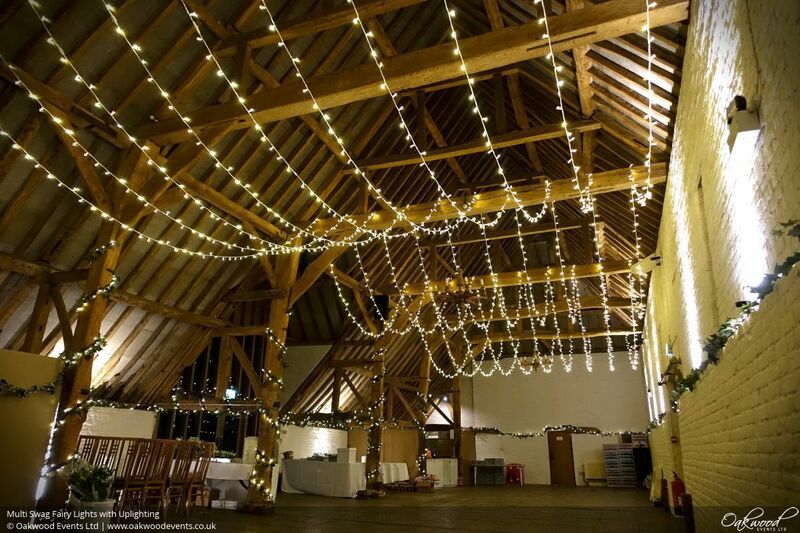 We were excited to be asked recently to install a large ceiling canopy of fairy lights for an event in the barn.